Simon Hartzell was born in about 1814 in Somerset County, PA and is believed -- although not entirely proven -- to have been the son of George and Mary (Younkin) Hartzell. He was a Civil War soldier who lost his life in the Confederacy's filth-laden Andersonville Prison. At the age of 22, on Feb. 6, 1837, he married 22-year-old Eva Ann Whipkey (1814 -1901), also from Somerset County, and the daughter of Henry and Elizabeth (Keefer) Whipkey. The marriage ceremony was held in Turkeyfoot Township, performed by justice of the peace Hugh Connelly. Among the witnesses were Moses King and Simon's brother John G. Hartzell, both of whom later dwelled in Greene County, PA. The couple produced a dozen children. Those who lived into adulthood were William Hartzell, Mahala Hewitt, Lindsy Hartzell, Elias Hartzell, Elizabeth Polen, Hannah Strait, Sarah A. Ross, Mary Marquis and Jacob Hartzell. Of the three who died in infancy, one passed at age nine months due to tuberculosis, one at seven week of tuberculosis and one at one day of age due to complications at birth. The Hartzell and Whipkey clans were close, and Simon's brother Jonas married Eva's sister (or niece) Anna Elizabeth. A family friend called the Hartzells "all healthy people." At some point before 1850, the Hartzells migrated from Somerset to Greene County, PA, settling on a farm in Aleppo Township. When the federal census enumeration was made in 1850, they lived in Aleppo with Simon working as a laborer (and the census-taker recording his name as "Samuel"). In 1860, the Hartzells dwelled next to Simon's brother Jonas and family in Aleppo. 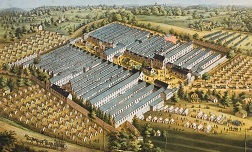 Above: emaciated Union prisoners at Andersonville. Below: the sprawling, filthy Andersonville prison. Famous Leaders and Battle Scenes of the Civil War. Now widowed, Eva Ann applied for and began receiving a military pension as compensation for her loss. [Widow Application #86.298 - Certificate #97.453] Her neighbors Mary Slonaker and Elizabeth Teagarden, who had assisted in the births of some of the Hartzell children, provided testimony in support of her claim. Her son Elias, discharged from the army, resided in her household from about 1863 to 1864 before marrying and leaving home. Eva Ann lived for almost 35 years after her husband's death. 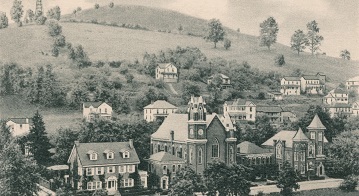 Said the Waynesburg Democrat, "She had been a member of the Christian church for a number of years and at her death held her membership at the Green Valley Christian church near Cameron, W.Va." In 1900, she made her home with her married daughter and son in law Mahala an Andrew Hewitt in Aleppo Township. The census-taker recorded that of the 12 children she had borne, only six were alive at the time. She passed away at the age of 86 years, six months and 22 days on Jan. 15, 1901. An obituary was printed in the Waynesburg Democrat, which stated that "Grandmother was loved by all who knew her." Rev. J.M. Murray led funeral services at Sugar Grove Church, followed by interment in the Phillips Cemetery. Son Elias Hartzell (1834-1889) was born in 1834 (or 1837) in Somerset County. When he was a teenager, his family relocated to Aleppo Township, Greene County. Among Elias' childhood friends were William B. King, Benjamin F. Phillips and John Henry. At the age of 23, in 1860, he was unmarried and lived at home in Aleppo, working as a day laborer. He had a light complexion, blue eyes and brown hair, and stood six feet, one inch tall. During the Civil War, at the age of 23, he enlisted in the army on Oct. 17, 1861, traveling to Cameron, Marshall County and thence to Wheeling, WV to enroll in the 1st West Virginia Infantry, Company D, commanded by Capt. Donnelly. Also joining the 1st West Virginia with him were his boyhood friend Edward Riggs and cousin Alexander Whipkey (son of John and Catharine Whipkey of Somerset County). He claimed to have been captured as a prisoner of war, exchanged back to the Union side, and then re-captured and re-exchanged. In June 1862, he became ill with "camp fever" or measles while stationed at Port Republic, VA and was sent to an army hospital for treatment. The following month, he was a convalescent at a hospital in Strasburg, VA.
Scott Powell's 1925 book, History of Marshall County, W.Va. reports that Elias "was wounded in a leg in Banks' retreat from Winchester, Va." In actuality, the left shin was broken near Kernstown on May 24, 1862 "when we were stampeded from near Winchester to Martinsburg & [he] was sick & in the wagon train and in the march he got his leg broken and mashed by the wagon in some way," wrote fellow soldier James Howard. Another mate, Edward Riggs, remembered that the leg was broken "while climbing into a wagon." With jagged pieces of the bone piercing his skin, he sat beside the road until picked up by a passing wagon train and taken to Academy Hospital in Winchester. After seven weeks, he was moved to Harpers Ferry, staying six weeks. From there, he was transferred to a hospital in Frederick, MD. After a month in Frederick, he was ordered to go to a hospital in the District of Columbia. He was sent after three weeks to Satterlee U.S.A. General Hospital in West Philadelphia, where he finally was discharged on Jan. 20, 1863. Within 18 months of the war's end, Elias began receiving pension payments from the War Department as compensation for his service-related ailments. [Invalid Application #121409, Cert. #104.897] When he arrived home, recalled his mother, "he was as rosy and fat as ever he was but that some months later from some unknown cause he commenced to lose flesh, & strength too...." He resided with his mother in Big Tree immediately after returning home. From time to time he attended dances and parties held in Cameron, WV. In about 1863, he met and attracted the eye of a local divorcee Maria (Rinehart) Flick ( ? -1897). She was the daughter of Simon and Hannah (Morris) Rinehart, and former wife of William Flick, having been divorced from him in 1858. Elias courted her for a year, and on Oct. 6, 1864, at the age of 30, Elias married Maria, in a ceremony held at the residence of Benjamin Wise in Aleppo, led by Rev. Adam Wise of the Dunkard Church. She later wrote, "I knew the soldier was in delicate health before I married him and he never got in robust health after that." The couple produced two or three daughters -- among them Martha "Ida" Hartzell and Hannah Eisiminger Baltzell Tedrow. The newlyweds moved to the farm of Harrison Phillips in March 1865 where Elias labored as a tenant farmer. In the fall of that same year, with Elias in poor health, Maria's father invited them to come dwell in his residence. They stayed with Father Rinehart for four or five years. In the harvests of the early 1870s, he and his brother in law John Morris Rinehart cradled grain together. Elias obtained work driving a stagecoach (or "hack" as it was then known) for Jacob Riegel, Robert Summersgill and Timothy Dover. His 28-mile route was between Rices Landing, Washington, Waynesburg, Jacktown and Cameron and this continued for about four or five years. The hack stable was in the rear of William A. Helphenstine's home in Waynesburg. He met with one major accident, when the hack overturned and rolled down an embankment. Although injured, he was able to right the vehicle and drive it home the same day. In 1870, their home was in Marion Township, Greene County, with Waynesburg as their post office. They were members of the Cumberland Presbyterian Church. Elias "was a much respected citizen," said the Waynesburg Republican. As Elias continued to suffer from ill health, still residing with the Rineharts and paying no rent, he quit work and depended solely on the pension he received from the federal government. He took odd jobs such as blacksmithing with his father in law, blowing the bellows and striking the hammer, and working for a wagon maker. At times he complained of pain in the kidneys, lungs and heart palpitations, as well as pain in his leg, occasionally coughing up blood, but with little confidence in doctors never sought medical care until it was too late. The broken leg had healed but was always crooked. On Feb. 28, 1874, Elias received a new position as a keeper of the toll-gate immediately west of Waynesburg. He maintained the job until his death. Their house, leased from the turnpike company, was small, poorly ventilated and unsanitary, contributing to his breathing problems. Wrote the family physician, "He was a spare built man with flat chest, nervous temperament which would predispose him to the development of tuberculosis with his unsanitary life at the toll-gate." I was living in Washington Pa. One day a party came into the store where I was and told me that Elias Hartzell had a hemorrhage in front of the Fulton House, a hotel in Washington. I went at once to the Fulton House and found him sitting on the steps and the blood was running from his mouth. Dr. Little was there attending him. I remained there ten for fifteen minutes till the blood ceased flowing. I then requested the Doctor to allow him to be removed to my house. After I got him to my house he commenced bleeding again. The hemorrhage continued about ten minutes and I went after the Doctor [who] came and treated him again and stopped the blood. he remained at my house about two days after that but did not have any more hemorrhages. In an obituary, the Waynesburg Democrat said that "He had many friends. He drove the Waynesburg and Cameron hack for quite awhile, and made many friends along the route, being always prompt and reliable." The family asserted afterward that his TB was due to his army service. Now widowed, Maria continued to operate the toll gate. She applied for but may not have been awarded her husband's Civil War pension. [Widow Application #426.072 - no certificate number known] Providing support in her claim was her husband's cousin Alexander Whipkey of Deep Valley. Maria survived her husband by eight years and was considered by a Waynesburg newspaper as "a highly respected woman." She developed lung and bowel problems and at one stage was confined to her bed for months, receiving medical treatment from Dr. John T. Iams. She died at home on April 12, 1897. Funeral services were held in the family Cumberland Presbyterian Church. In an obituary in the Waynesburg Republican, her survivors were listed as three children and her siblings Prof. J.R. Rinehart and Morris Rinehart of Waynesburg and Mrs. Hambright of Pittsburgh's East End. He slept in the engine house at the west end of town Sunday night, leaving about 5 o'clock in the morning, stating to the watchman that he must go home to breakfast, about one-half mile distant. But inquiry at his home revealed the fact that he did not arrive at home until between 7 and 8 o'clock. He was heard talking to his wife, with whom he does not get along well, at the post-office on Saturday before the murder, telling her he was going to leave. She reminded him of the fact that he did not have any money, to which he replied, "I will have $200 by Monday noon." He pawned his watch Saturday, saying that he needed some money. After this he went to Denny & Co.'s hardware store and bought some .32 calibre cartridges of Lew Waddell.... And while nearly everybody else in the community were at the scene of the murder young Eisiminger never went near, but came to town and purchased a pair of new shoes of Bert Myers in H. Hull's shoe store, presenting a five dollar bill in payment. I want you to know that I am sorry for all the pain and sorrow I have caused you. I hope you will all forgive me. I hoe you will come in time to forgive me, if you cannot forget your own trouble now, and not cherish enmity against me. God knows I am sorry, and if it were to do over again, not all the money in the world could hire me to do what I then did. If I could only live the last few years over again they would be different. I hope to meet you in a better world. This is another lonely and dreary day and I thought I would write you a few lines to tell you that I have made peace with my Lord and Savior Jesus Christ, peace that I never had when I had my liberty. My dear wife, we all know that we have to die sometime and we know we will come before a righteous Judge who will judge you and me. When we come before him, if we have sinned a sin that we have not repented of and asked God for Christ's sake to forgive us, he will condemn us, and we will be lost forever. Dear wife, I have confessed all my sins and have repented and I am sorry that I have sinned against God. I have Christ's word that my sins are forgiven. I beg of you to prepare for that day. Dear wife the judgment day is not far off and I beg of you to prepare for it. Dear wife I have loved you better than anything on earth, be saved with me. Turn to the 24th chapter of Matthew and study carefully. Christ says we shall see wonders, the sun shall be darkened and the moon shall not give her light, we know that the end is near, but no man can tell just the day or the hour. We have seen these things. In 1780 the sun was dark and the people could not see to read and that night the moon refused to give its light. He said the stars should fall from heaven. On November 13' 1833, the stars did fall from heaven. The end is near, now. We have had the signs. Turn to the 13th chapter of Mark and study it. There are to be wars and rumors of wars. We have had wars. China and Japan and many others. We have had rumors of wars, Mexico against some two or three little countries. We shall have famine. There was a great famine in Russia and at present one in Nebraska. Christ said it shall be as Noah before the flood. Noah preached 120 years and now it has been 115 years since the sun was darkened and the moon refused to give light. It's my belief that the end is near and I beg of you to prepare for that day. My dear wife, as I have written many times before, you need not have any doubts as to my being forgiven. I have the full assurances that I am forgiven and when I leave this world I will go to my redeemer where I will have no sorrow, no trouble, no pain. It will be all pleasure. You will find many passages I have marked both in the old and new testaments. Hoping and trusting you will take my advice and prepare to meet me I will have to leave you and my little Nellie. But dear wife remember I loved you both and have to die because I loved you so well that I write to you when I had my liberty. Good-by, dear wife and little one and may God bless you. Your husband, John Eisiminger. On the fateful day, law enforcement officers went to John's jail cell to say it was time, he wept profusely and asked for more time, saying he could not walk out. Reported the Waynesburg Democrat, "He was informed that it was a sad duty but that it could not be avoided. The culprit then begged for chloroform which was denied him but a capsule containing a grain of morphine was given him. Deputy John McKahan then told the prisoner that he had already suffered more than he would be called on to suffer again, that death would be painless, etc. The condemned then summoned up his courage, the straps were put in their places and the sad procession started to the scaffold.... The first look at the scaffold and the dangling noose struck the condemned man with terror and many thought that he would break down, but he rallied and ascended the steps. His last words were 'God have mercy on my poor soul'." "Doctors Blair, Ullom, Cross and Milliken were in attendance, and say that the neck was broken by the fall of 42 inches. The pulse ceased to beat in 14 minutes and 2 seconds. The doctors agree that death was painless and that the execution was as nearly perfect as possible." His body was placed into a casket and was escorted by a large procession to Green Mount Cemetery for burial, with Rev. KcKain of Rogersville and Rev. Stephens of Waynesburg officiating. As a young widow of 27, Hannah had to face not only public humiliation and shame but also the reality of raising an infant daughter by herself. Two-and-a-half years later, after suffering the passing of her mother, she married for a second time, to 57-year-old farmer James Baltzell (1841- ? ), son of Abraham and Sarah Baltzell of Waynesburg. Rev. J. Fletcher Dyer officiated at the ceremony held on Feb. 9, 1898. It was James' first marriage, and they were more than a quarter century apart in age. The couple made their home in the old west end toll-gate house of Hannah's deceased parents. Heartache continued to rain down on the lives of Hannah and her daughter. A little more than two years into te Baltzells' marriage, James contracted a deadly case of typhoid fever and passed away on Oct. 4, 1900. A short obituary in the Waynesburg Democrat noted that he was about 60 years of age at death. Now widowed for a second time, Hannah gave birth to a son, James "Leland" Baltzell, two years later, in 1902. The identity of the boy's father is unknown. Hannah wed for a third time in 1904 to 54-year-old farm laborer Joseph Tedrow (1850-1942), son of William and Sarah (Strait) Tedrow of Greene County. He had been married twice before to Mary Whipkey and Anna Sheets. They made their residence in Aleppo Township, where he belonged to the Windy Gap Church. Census records of 1910 show that the couple dwelled beside the family of Lindsey and Elizabeth Hinerman. Evidence suggests that the Tedrow marriage was rocky, and that the couple separated during the decade of the 1910s. In 1920, Hannah and son Leland made their home on Fifth Street in McMechen, Marshall County, WV, next door to her married daughter Nellie and her husband Frank Amos. At that same time, Joseph is believed to have remained in Greene County in and around the Holbrook community of Jackson Township. Her final years were spent in widowhood in McMechen. Suffering from bronchial asthma and pneumonia, she died at the age of 54 on Feb. 8, 1923. Son Thomas Leland Baltzell of McMechen signed her death certificate. Burial was in Cameron, Marshall County. Joseph, her widower, remarried for a fourth time to Rebecca Kerns. Toward the end of his life he suffered from senility and hardening of the arteries, and he died of a heart attack at the age of 91 on March 21, 1942, at the home of Raymond Yoders in Holbrook. Jesse Rinehart was the informant for his Pennsylvania certificate of death. His obituary in the Waynesburg Democrat noted that "two children are also deceased, the only survivors being a granddaughter, Mrs. Goldie Holpp, Warwood, W Va., and a sister, Mrs. Agnes Wendt, Cameron, W.Va."
Grandson James "Leland" Baltzell (1902- ? ) was born in 1902, presumably in Aleppo, Greene County. He grew up in McMechen, Marshall County, WV. Granddaughter Nellie V. Eisiminger (1895- ? ) was born in about 1895. She was but a baby when her father was hung for murder. At the age of 17, on Jan. 17, 1912, she was united in holy wedlock with 21-year-old Frank Amos (1892-1959), son of Vincent and Amanda (Beatty) Amos of Wetzel County, WV. Because she was underage at the time, Nellie obtained her mother's consent in writing to the union, and fibbed that her age was actually 19. Their children were Katherine A. Amos, Wilma L. Amos and Robert Amos. Frank for many years was employed by the railroad as a brakeman. In 1920, they made their residence in McMechen, Marshall County, WV, next door to Nellie's separated mother. By 1920, they had relocated to Tallman Street in Hollidays Cove, Hancock County, WV, where Frank continued his work as a railroad conductor within the works of Weirton Steel. They moved again during the 1930s to a new home on Hudson Avenue in Hollidays Cove, this time in Brooke County, WV. By the late 1950s, their address was 107 Harmon Avenue in Weirton, Hancock County. Frank was felled by a heart attack and died at home on Aug. 24, 1959. His remains were transported to Chestnut Ridge Cemetery in Florence, Washington County, PA for interment. Daughter Sarah A. Hartzell (1836 - ? ) was born in about 1836 in Somerset County. In 1860, at age 21, she dwelled with her parents and, although unable to read or write, was considered a "home domestic." Daughter Mary Jane Hartzell (1841-1927) was born on May 27, 1841 (or 1840) in Greene County. Mary wed Thomas J. Marquis (1845- ? ), a native of Cumberland, Allegany County, MD or of Cameron, Marshall County, WV. Mary was five years older than her groom. They had these known offspring, George Washington Marquis, Annie Yoders, William Henry Marquis, Frank Foster Marquis, Sarah E. Marquis, Cora Bonar and Violet May (or "Viola") Simms. They first dwelled in Greene County, where their three eldest children were born. Then, sometime after 1874, they relocated across the West Virginia state line and occupied a farm near Cameron, Marshall County. They remained there for many decades. In 1880-1900, their home was in the Liberty District, with Thomas and their sons George and William working as laborers. Thomas' fate is not yet known, but he died before his wife, and they are not buried in the same grave. Mary contracted a deadly case of bronchial pneumonia and died at the age of 85 on Feb. 25, 1927. Burial was in Cameron's Highland Cemetery. Daughter Cora Bonar of Cameron signed the death certificate. Son George Washington Marquis (1866-1945) was born on Sept. 13, 1866 in Greene County, PA or in Cameron, Marshall County. He was a longtime employee of the Baltimore and Ohio Railroad, eventually becoming a conductor. On Oct. 7, 1886, the 21-year-old George married 16-year-old Mary E. Howard (1871- ? ). The wedding was held in Cameron and officiated by elder J.R. Wilson. Among their children was Homer Dean Marquis. Circa 1920, they dwelled in the Benwood section of Marshall County, with George working as a laborer in a local steel mill. By the 1940s, they made their home in Wheeling, Ohio County, WV, at 513½ North Wabash Street. Afflicted with heart disease, George died on Sept. 24, 1945, at Ohio Valley General Hospital, some 11 days after his 79th birthday. Homer D. Marquis of Wheeling was the informant for the death certificate. Burial was in Greenwood Cemetery in Wheeling. Son William Henry Marquis (1875-1951) was born on June 27, 1875 in Greene County, PA. He moved to Cameron and spent his life there, never marrying. Following his parents' occupation, he was a farmer, and apparently lived with them until their deaths. After retirement, he made his home on West Main Street in Cameron. He died at the age of 75 on Jan. 4, 1951. He was laid to rest beside his mother in Highland Cemetery in Cameron. Mrs. Elizabeth Brandon was the informant for the official West Virginia certificate of death. Son Frank Foster Marquis (1877-1948) was born on Dec. 16, 1877 in Marshall County, WV. He was united in matrimony with Marie Agnes (?). Their home was in rural West Alexander in Ohio County, near the Pennsylvania state line. Frank suffered from syphilis and at some point developed gangrene in his left foot which led to amputation mid-thigh. He was felled with a pulmonary embolism and died at age 70 on May 11, 1948. He is believed to be interred in a cemetery at Rosby's Point, Marshall County, but this needs to be confirmed. Daughter Sarah E. Marquis (1879- ? ) was born in 1879 in Marshall County, WV. At age 21, in 1900, she was unmarried and lived at home. Daughter Cora Marquis (1884-1952) was born on June 14, 1884 in Cameron. On New Year's Eve 1901, at the age of 17, she married 22-year-old James I. Bonar (1879 - ? ) of Cameron. The ceremony took place in the bride's home, officiated by Rev. J.H. Bristor. Their one known son was Harold D. Bonar. The Bonars were farmers, and the 1910 census of the United States shows them living in Marshall County's Clay District. In 1951, they lived in Cameron. Later, in retirement, they relocated to 433 North Huron Street in Wheeling, Ohio County, WV. She was felled at home by a cerebral hemorrhage just two days before her 68th birthday, dying June 12, 1952. Her remains were placed into eternal rest in Greenwood Cemetery. Daughter Violet May (or "Viola") Marquis (1896- ? ) was born in July 1896. At the age of 17, on Dec. 23, 1911, she was united in marriage with 23-year-old Thurman Simms (1888-1952) of Greene County. He was the son of Newton and Emma (Wright) Simms. At the time of their wedding, they both lived in Moundsville. Rev. J.L. Lucas, of the Church of God, oversaw the ceremony, held at the home of David Hartline. Thurman and Violet resided in rural Marshall County along Big Grave Creek. They had one known daughter, Mannie Simms. Thurman was employed as an engineer with a Moundsville stamping works and later with Marx Toy Company. Suffering from lung and heart problems, he was admitted to Reynolds Memorial Hospital in Glendale near Moundsville. He died at the age of 63 on July 4, 1952. Burial was in Limestone Cemetery near Moundsville. Daughter Elizabeth Hartzell (1843 - ? ) was born in about 1843 in Greene County. She died of tuberculosis prior to 1901. Her paper trail has gone cold. Son Jacob C. Hartzell (1846-1931) was born in December 1846, in Greene County, although some in his family believed the birth occurred just over the border in West Virginia. He was 18 years of age when his father died in a Confederate prison camp during the Civil War. In about 1871, when Jacob was age 25, he married 22-year-old Eliza Jane Galentine (1849-1932). They initially resided in Aleppo, Greene County and produced six children -- Sarah B. Hartzell, George K. Hartzell, Martha J. Hartzell, Ward B. Hartzell, Jessie O. Hartzell and William Wiley Hartzell. During the years in Aleppo, Jacob earned a living as a farm worker. At some point between 1882 and 1886, the Hartzells migrated to south-central Nebraska. Census records for 1900 indicate their dwelling-place as Leister, Clay County, NE, where Jacob was a farmer and their son Ward helped with farm labor. That year, five-year-old Nebraska-born niece Ethel Closson lived under their roof. By 1910, with the Hartzells having been married for 49 years, all of their children were gone from the household with the exception of their son William Wiley. The 1910 census shows Eliza's widowed brother Isaac F. Gallentine boarding in their home in the Lynn Precinct of Clay County. The federal census of 1920 shows Jacob and Eliza residing in Inland Township, Clay County, NE, with Jacob marked as retired. In 1925, he was mentioned in the Waynesburg, PA newspaper obituary of his brother William. Jacob went to his eternal rest on July 13, 1931 at the age of 86. He was interred in Inland Cemetery in Clay County. Eliza only lived for another nine months. She passed away on April 9, 1932 at the age of 83. She was placed into repose beside her husband. Daughter Sarah B. Hartzell (1872- ? ) was born on Aug. 29, 1871 in Aleppo, Greene County, PA. As a young teenager, she migrated westward to Nebraska with her parents and younger siblings. There, she married Ellsworth Scott Gallentine (1862-1936), presumably a cousin on her mother's side. Their three known children were Hallie G. Broughton Gallentine, Eldon B. Gallentine and Paul Howard Gallentine. At some point they pushed into Iowa and made their home in Imogene, Fremont County. In their later years, they dwelled in Magnolia, Harrison County, IA. Ellsworth died there the day after Christmas 1936. Burial was in Magnolia Cemetery. Sarah lived for another two years, passing on Nov. 11, 1938. Granddaughter Hallie G. Gallentine (1895-1972) was born on Dec. 16, 1895 in Imogene, Fremont County, IA. She was twice married. On Dec. 16, 1913, she wed her first husband, Lewis William Broughton (1892-1927), son of Frank McClelland and Nancy Jefferson (Thomas) Broughton. They had five known children -- Calvin C. Broughton, Flossie M. Broughton, Hartzell W. Broughton, Herbert Broughton and Ellsworth Broughton, born between 1914 and 1920. Sadly, Lewis passed away at the age of 35 in 1927. Hallie married again to a presumed cousin, Daniel T. Gallentine (1868-1955), who was nearly three decades her senior. They produced a son of their own, Clifford Eugene Gallentine. Daniel died on Sept. 23, 1955, with burial in Magnolia Cemetery. Hallie resided as a widow until her death in December 1972. Burial was in Magnolia Cemetery. Grandson Eldon B. Gallentine (1911-1978) was born on July 15, 1911. He married Helen Marie Schomaker (1914-2008). They had no children. He passed away on Aug. 25, 1978, at age 67, with burial in Magnolia Cemetery. Helen lived for another 30 years. She died at age 93 on April 27, 2008 in Gretna, Sarpy County, NE. Grandson Paul Howard Gallentine (1913-1970) was born in 1913 in Iowa. He eventually moved to Southern California, establishing a home in Ontario, San Bernardino County. He died there on Oct. 22, 1970. His remains were brought back to Iowa to rest in peace in Magnolia Cemetery. Son George K. Hartzell (1873- ? ) was born in about 1873 in Aleppo, Greene County or in Ohio. He migrated to Nebraska when his parents and siblings moved in the 1880s. He is believed to have married Anna (1875- ? ) in Iowa in about 1901, when he would have been age 28 and she 25. If so, they made their home in Iowa until the late 1910s, producing three children -- Jesse Hartzell, Darrell Hartzell and Alpha Hartzell. In between 1907 and 1910, they left Iowa and moved to Inland Township, Clay County, NE, where George's are known to have dwelled. Daughter Martha J. Hartzell (1876- ? ) was born during the nation's Centennial in 1876 in Aleppo, Greene County. Son Ward B. Hartzell (1882- ? ) was born in August 1882 in Aleppo, Greene County. By the time he had reached the age of four, his family had migrated to Clay County, Nebraska. At the age of 21, in 1903, Ward married 22-year-old Kansas native Ella G. Bartlett (1881- ? ). In 1910, they resided in Leicester Township, Clay County, with Ward earning a living as a farmer, and 22-year-old brother in law Morton Bartett boarding under their roof. Their two known children were Wayne L. Hartzell and Edna M. Hartzell. Daughter Jessie O. Hartzell (1886- ? ) was born in September 1886, the first of the family offspring to enter life in Nebraska. Son William "Wiley" (or "Wylie") Hartzell (1893- ? ) was born in January 1893 in Nebraska. At the age of 17, in 1910, he lived with his parents and helped with the home farm. He married Ora R. (?) (1895- ? ) and lived in Lynn Township, Clay County circa 1920. The couple's three known children were Clayton C. Hartzell, Iona R. Hartzell and Jean H. Hartzell. Son William Hartzell (1849-1925) was born on Feb. 12, 1849 in Aleppo Township. He never married but appears to have spent his his entire life in Aleppo, working as a laborer. He was afflicted with stomach cancer and went to the home of his brother Lindsay near Woodruff, Marshall County, WV. There, he died at age 76 on Aug. 19, 1925. Burial was in Wise Cemetery in Greene County, with Rev. W.H. Pierson officiating. His brother Lindsay, of Woodruff, WV, was the informant for the death certificate. Daughter Hannah Hartzell (1851-1881) was born on July 7, 1851 in Greene County, with other records giving her birth year as 1850 and 1852. Family friends and midwives Eva Anne Muskey [spelling?] and Sarah Anne Ross helped to bring her into this world. Hannah was wedded to John Strait (1848-1906). Their only known children were Elizabeth A. Anderson, Mary E. Warrick and Floyd Strait. Sadly, Hannah was stricken with spinal meningitis and fever and died on May 22, 1881 at the age of 30. Burial was in the Slonaker Cemetery in Greene County. Her death left her widower with three young mouths to feed. He lived for another quarter of a century. He married again to Mariah Bosworth (1855-1927) -- daughter of George and Rebecca (Lewis) Bosworth -- and dwelled on a farm in Aleppo. They produced six more children of their own -- Jessie Strait, George Strait, Ray Strait, May Strait, Walter Strait and Bertie E. Strait. For reasons not yet known -- whether employed or incarcerated -- John was in Western Penitentiary in Pittsburgh in 1906. While there at the age of 58, he fell in an elevator and died of meningitis a week later on April 13, 1906. He rests for eternity beside his wife. His death certificate suggests his remains may have been placed at one time in Woodruff, WV. Mariah lived in widowhood for more than two decades. Laboring under hardening of the arteries and heart valve weakness, she died at age 71 on June 2, 1927. Her remains were placed into entombment in Wise Cemetery. Daughter Elizabeth A. "Lizzie" Strait (1874-1949) was born on Nov. 15, 1874 in Greene County. At the age of 21, on Nov. 24, 1895, she married 24-year-old John W. Anderson (1870-1940), son of John and Nancy Anderson. Rev. J.M. Murray officiated. At the time of marriage, John was a farmer in McCracken and Lizzie was a kitchen maid at Big Tree. Elizabeth and John resided on a farm in Greene County but had a postal address of Cameron, WV. They had two known sons -- Wilbert E. Anderson and Robert Jesse Anderson. Sadly, on July 15, 1921, their son Jesse succumbed to diphtheria at the age of 16. John was burdened with chronic heart disease and hypertension, and died from their effects at age 69 on July 23, 1940. Stricken with heart problems at the age of 74, she died in Wheeling's Ohio Valley Hospital on Feb. 27, 1949. Burial was in Slonaker Cemetery in Aleppo Township. Charles Anderson of Cameron was the informant for her West Virginia death certificate. Daughter Mary E. Strait (1877- ? ) was born in 1877. When she was age 18, on Sept. 3, 1895, she was wedded to 24-year-old farmer William S. Warrick (1871- ? ). He was the son of William and Mary Jane Warrick, and was considered a "distant relative" to his new wife. Justice of the peace James Courtwright officiated at the nuptials held in McCracken, Greene County. Son Floyd Strait (1879-1964) was born on July 27, 1879. He would only have been two years old when his mother died. In 1910, he was unmarried at the age of 30 and, after his father's tragic death, had assumed responsibility for the home farm. Living under his roof that year were his 55-year-old widowed stepmother and four of his half-siblings. On Jan. 18, 1911, when he was age 31, Floyd married 32-year-old Sarah Elizabeth McCormick (1878-1951), daughter of James and Margaret (Slonaker) McCormick. Rev. J.M. Murray oversaw the nuptials held at the home of George Wendt near Cameron. Sarah had been married once before and brought a daughter to the marriage, Mrs. Floyd Arnold. They lived on a farm in Aleppo in 1920 and had five known children -- Wanda F. Strait, Charles "Stanley" Strait, Merle M. Strait, Margaret Strait and Betty Maxine Chambers. That year, his step-mother and half-siblings made their home two doors away. Sarah died of a stroke at age 73 on Nov. 28, 1951. She was laid to rest in Slonaker Cemetery in Aleppo Township. Floyd lived for another 13 years. He died at the age of 84 on Feb. 3, 1964. An obituary printed in the Waynesburg Republican noted that he had "spent his entire life in the Aleppo Township area [and was] a member of the Quiet Dell Brethren Church." He was survived by eight grandchildren, nine great-grandchildren and one step-grandchild. Daughter Mahala Hartzell (1855-1938) was born on Jan. 2, 1855 in Aleppo Township. Assisting in her birth were midwives Mary Slonaker and Elizabeth Teagarden. Mahala grew up in Aleppo Township. She married farmer Andrew Donalson Hewitt (1856-1926), son of Peter and Charlotte (Smith) Hewitt of Greene County. Their home was on a farm in McCracken, Greene County, but their post office was R.D. 1, Cameron, WV. They had one known daughter, Lottie Hewitt. The 1900 federal census shows the family in Aleppo Township, with Andrew's occupation shown as "boarding H. Keeper." In their home that year were 12-year-old daughter Lottie and Mahala's 85-year-old widowed mother. Just eight days before his 69th birthday, struggling with the effects of aortic stenosis, Andrew died on Oct. 16, 1926. Mahala survived her husband by a dozen years. Toward the end of her life, she dwelled in Waynesburg, Greene County. She was burdened with heart and kidney disease and died from their effects on Nov. 29, 1938, at age 84. Interment was with or near her husband at Sugar Grove Cemetery in Greene County. George Finch in Waynesburg gave vital information for her death certificate. Daughter Lottie Hewitt (1888-1919) was born in May 1888 in Aleppo. As a young adult, she lived at home in McCracken. At the age of 26, just three days after Christmas 1914, Lottie self-united in marriage with 35-year-old Aleppo resident George W. Finch (1879-1951), son of William and Elizabeth (McVay) Finch. It was a first marriage for both, and at the time, he worked as a laborer. George and Fannie Weimer were witnesses. In an interesting twist, George's sister Sarah Floretta "Etta" Finch married Lottie's distant cousin Daniel R. Finnegan, son of John T. and Eliza (Younken) Finnegan. Lottie and George produced two offspring -- Ruth Shultz and W. Howard Finch. They resided in Washington, Washington County, PA. Tragically, Lottie was swept up in the epidemic of influenza that carried away many in the nation immediately after World War I. She died on Jan. 8, 1919 at the untimely age of 30. She was entombed in Cameron, Marshall County. An obituary was published in the Waynesburg Democrat Messenger. George was wedded to a second wife. He died at the age of 71 in Millersburg, OH on Jan. 19, 1951. Funeral services were held in Millersburg. Son Lindsay Hartzell (1857-1949) was born on June 9, 1857 in Aleppo Township. Assisting in his birth were midwives Mary Slonaker and Sarah Anne Ross. He grew to manhood in Aleppo Township. He married Harriet Sloan (1856-1928), daughter of Morgan and Catherine (Vanderhof) Sloan of West Virginia. The couple produced at least three children, Elias Hartzell, Frank Hartzell and Margaret "Maggie" Hartzell. When the federal census was taken in 1880, the family dwelled on a farm in the outskirts of Waynesburg, Greene County. Circa 1911, their home was in Big Tree, Greene County. They were farmers and in 1925 resided in Woodruff near Moundsville, Marshall County, WV. Over the years, Lindsay passed along family history stories to John W. Hartzell (1916-1975), son of his cousin Charles Milton Hartzell. At the age of 72, Harriet was felled by aortic stenosis and died on Aug. 17, 1928. Later, in 1947, Lindsay relocated across the state line into rural Donegal Township, Washington County, PA, where he spent his final two years on earth. Having become senile, and suffering from hardening of the arteries, Lindsay died on March 11, 1949, at the age of 91. Burial was in Sugar Grove Cemetery. Frank Hartzell, of West Alexander, Washington County, provided details for the death certificate. Son Elias Hartzell (1878-1911) was born in about 1878. As a young man, he was married, had four children and lived in Cameron, Marshall County, WV. When he was 33 years of age, he contracted tuberculosis and died at age 23 on April 29, 1911. A brief obituary was printed in his hometown newspaper, the Waynesburg Republican, which noted that burial was in Cameron Cemetery. Son Frank Hartzell dwelled in Big Tree, Greene County in 1911 and in West Alexander, Washington County, PA in 1949. Daughter Margaret "Maggie" Hartzell ( ? - ? ) lived in Big Tree in 1911. Research for this page graciously shared by the late Olive (Rowan) Duff, the late Donna (Younkin) Logan and Marlyn Hartzell Dalsimer, a.k.a. Marlyn Klee-Hartzell. Others researching the Hartzell family have been Beverly Palarino, John C. Foster, Louise Dollison Marsh, Martha Jane Martin and Barbara Erlenbach. In the 1920s and '30s, Dr. J. Culver Hartzell, of Blue Ash, OH, paid genealogists to search for records. Elias Hartzell and John Eisiminger news story images courtesy of the Cornerstone Genealogical Society, Waynesburg, PA.